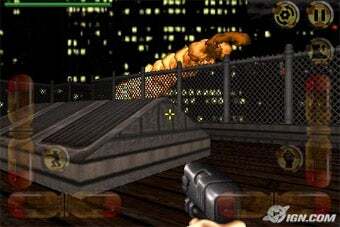 Duke Nukem Forever might be dead, but the spirit of the name lives on, as MachineWorks Northwest prepares to release an updated version of Duke Nukem 3D for the iPhone. Yes, MachineWorks is delivering a smoothed-over but faithful port of the original Duke Nukem 3D to the iPhone. MachineWorks is the same team that brought Prey Invasion to Apple's platform, and they've taken that experience and used it to bring back the Duke for a little touch screen shooting action. According to IGN, the game will feature on-screen control bars for movement and looking about, while enemies can be fired upon by tapping them with your finger, which in a perfect world would lead to countless "I'd tap that" comments from the man himself. I'm not a big fan of the tap-to-shoot mechanic myself, preferring the accelerometer-based targeting of id's recently-released Doom Resurrection. Still, Duke fans should appreciate the chance to carry him in their pocket wherever they go. Look for Duke Nukem 3D to appear in the iTunes App Store "soon".